And by "wordless" I mean LESS WORDS. Because LEZBHONEST, it would be impossible for me to have a post and not write SOMETHING. But I know this is a busy week for everyone! (I can't believe we are less than a week from Christmas!) I'm guessing peeps may not have time to read one of my long posts, where I bore you with my intense feelings about things like cocktail napkins. But how about a long post of mostly pictures? Editor's Note: I took these pics myself. They aren't "profesh blogger pics" but I'm trying to teach myself! I'm sure your house is already swagged but if it's not, maybe you'll gain some inspiration! At the very least seeing a bunch of pics of Christmas decor is sure to get you in the holiday spirit! Huzzah! This is our living room. It's right there when you walk in the door on the right. It's where I enjoy hiding from my kids. I like to let peeps know what we are all about in the holiday season (Advent) by having my favorite creche set on display for all to see in the living room. Also-- I try to stick with holiday decor that's the same colors as the room. Monochromatic is the spice of life! Baby Jesus is glued into this set just FYI! You're about to discover that the theme of my holiday decor is PUFFY COTTONBALL STUFF that looks like snow. This is a #protip I learned from my mom. It just makes everything more cozy and festive! I took this pic before I put lights in with these trees. Keeping similar items grouped together but with different textures, is a nice effect! This is a wreath on the back of our front door. Does anyone hate Elf on a Shelf as much as me? I could write a whole post just about how I wish "Sparkle" would take The Big Sleep. I won't show you my dining room because I'm not trying to have you go blind today. As of right now it's my catch all for teacher gifts, random crap, and all the ornaments I confiscate from Margaux's mouth. Yes it's assault to your ojos, I know. I took pics of the kitchen at dusk. Not sure if that was a good idea. My favorite part of life is MOOD LIGHTING so I wanted to show the mood and not have it too too bright. My kids made those little ornaments you see on the windows. I was literally short-circuiting watching Felicity hang them. But instead of slapping them out of her hand and being like THAT'S A NO FOR ME, DAWG. I've kept them up. They are pretty tiny so it's not that bad. One of my requirements is having a kitchen centerpiece I can easily move around. As much as I love these big elaborate "moments" on a table, they just aren't realistic for my family. Having holiday decor in jars or on a tray makes it easy to move around. One of the best parts of redoing the kitchen was gaining more counter space. I love decorating this corner of the counter each holiday. One of my girlfriends suggested I do a post just on my counter decor! Ha maybe one day! In the mean time here's what I have for Christmas. The big ginger jar is always there so I sort of decorate around it. I'm particularly proud of this bell jar situation. I got it at Homegoods and put battery operated lights, "snow" and little trees in it. (Lights from TJ MAXX, snow and trees from Michael's.) I'll probably keep it here and continue to rotate things depending on the holiday! It's so cute. Onward Christian Soldiers, to the TV room! These pics are super unedited. I didn't "style" anything. 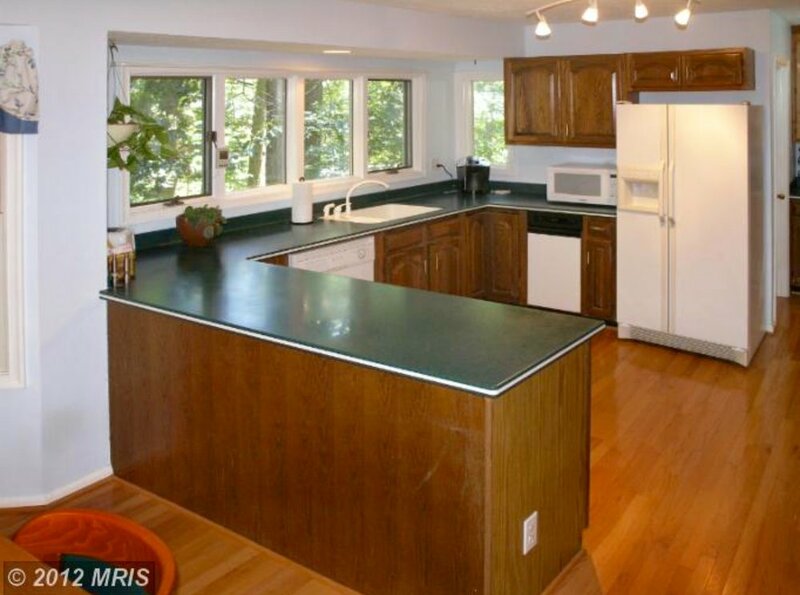 I look at other home tours online and I'm like there is NO WAY your house always looks like that. This is pretty much what it always looks like complete with 3 girls on the couch. Oh, and 47 random things on the floor. I did clean those up because I love you. Found these antlers at Michael's and I be obsessed. My tree is a horse of a different color this year. Aka it's kind of NOT LEGIT. Mainly because of the baby Godzilla that is Margaux. She's 15 months. Her life's goal is to ruin my life's goal of awesome holiday decor. Because she rips ornaments off the tree for breakfast. And also tries to eat them for breakfast. ALL THE TIME. I'm actually still considering just taking all of them off. Here are some pics of my favorite ones I've managed to salvage from Margaux the Terrible. Even the camera is rejecting the advances of my ugly tree. Speaking of things Margaux is trying to ruin-- she's also trying to ruin my deep, romantic love affair with fake snow. She only has access to this snow but she makes it worth her time. She thinks its HILARIOUS to rip it apart and throw it on the floor. HA HA HA MARGAUX. HO HO HO MARGAUX. NOT. COOL. This pic above is the aftermath of The Abominable GauxGaux. It looks like it's melting in not a uniform fashion. This is what you call a "big problemo." I'm obsessed with the bird and her fur. Just obsessed. Also obsessed with our Blessed Mother, obvi. The two trees I have in the basement are also from Target. The theme of my life is basically Homegoods, Target, Home, Repeat. They were super reasonable and they create a nice ambiance. If I had it my way I would have a tree in every room! So there you have it. Our house decorated for Christmas! I hope it was as lovely for you as it was for me! I will try to post once more this week. Hopefully I can find some time. If not I hope everyone has a wonder Christmas! Subscribe to the blog and follow me on IG and Snap!